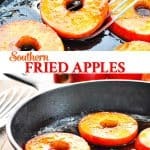 Southern Fried Apples are a simple side dish or light dessert, and they're ready in 15 minutes! Cinnamon, sugar and butter turn the fresh fruit into a delicious, down-home treat! Southern Fried Apples are a simple side dish or light dessert, and they’re ready in 15 minutes! 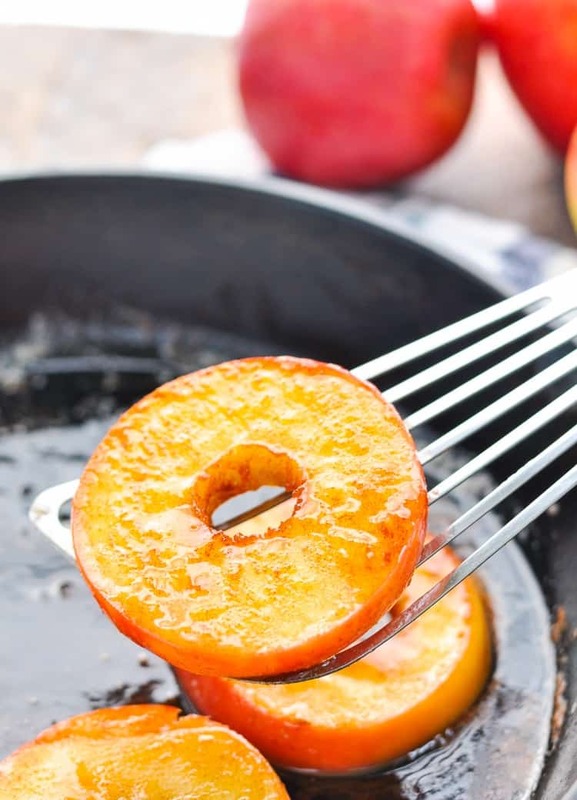 Cinnamon, sugar and butter turn the fresh fruit into a delicious, down-home treat! September and October are the HEIGHT of apple season here in Central Virginia, so the fruit makes an appearance at almost every meal of the day. I’ll take any excuse that I can get to enjoy some sweet Southern Fried Apples, so I treat them as a side dish alongside my 4-Ingredient Pork Loin Roast or with a Dump-and-Bake Sausage and Cabbage Dinner. But you know what? They’re equally good at breakfast with Dump-and-Bake Buttermilk Pancakes, or with a scoop of vanilla ice cream and a drizzle of caramel sauce for dessert. Again…apples…all day, every day! I’ve made my fried apples into rounds that I can flip like a pancake here, but you can also just pan fry apples slices with the same method. The end result is delicious — no matter which shape you choose! 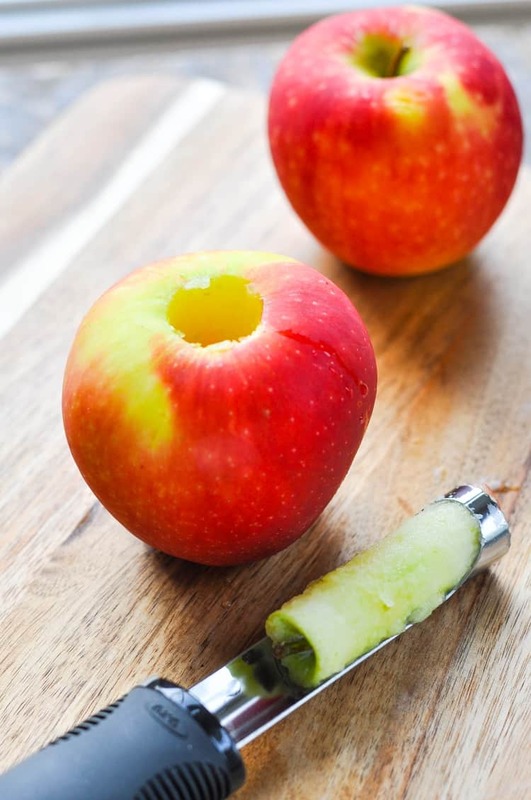 I use this inexpensive apple corer to punch out the center of my apples before slicing them (you can also use a knife if you prefer). The corer just makes it so neat and easy! 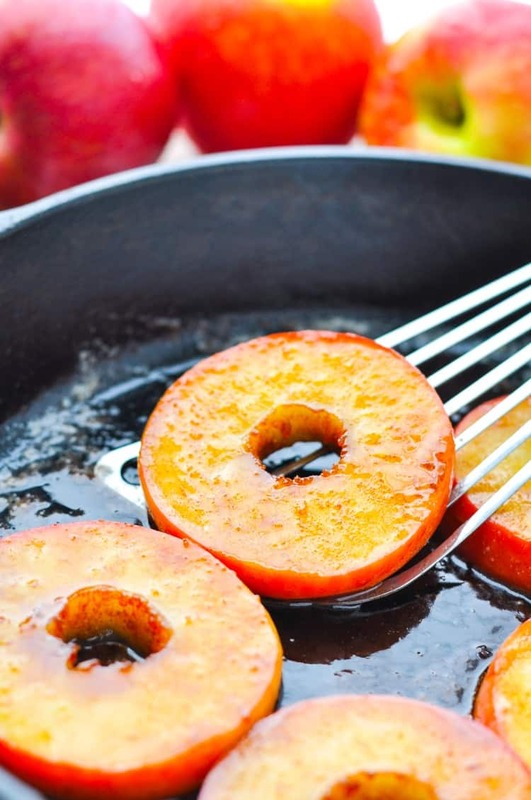 What are the best apples to fry? Honestly, my advice is to fry any variety of apple that you love best. That said, certain apples work better than others. Ideally, you want to use firm apples that stand up to the cooking process. Your best bets are Granny Smith apples or Honey Crisp apples. My kids love the sweetness of the Honey Crisp, while I love how the tartness of the Granny Smith contrasts with the sweet buttery syrup. 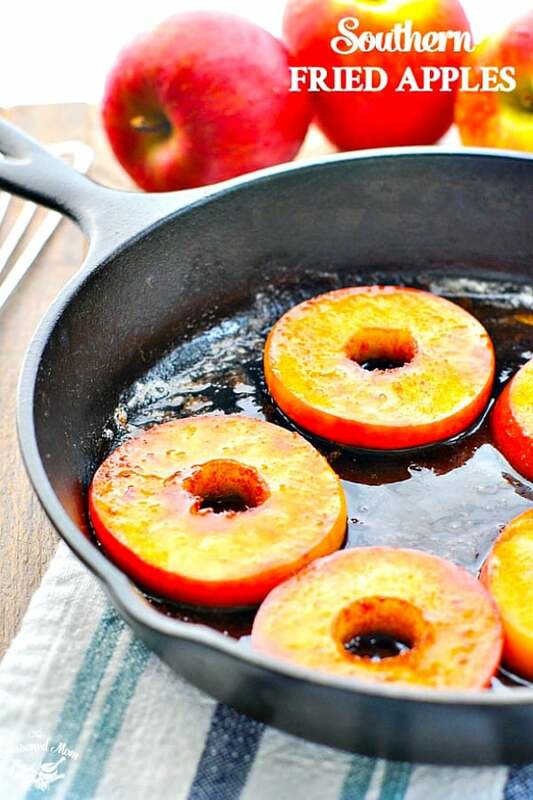 To fry your apple slices, simply melt the butter in a skillet, add the apples, and sprinkle with cinnamon and sugar. Allow the apples to sit (without stirring or flipping) for a few minutes. 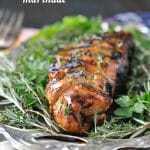 This gives them a chance to brown slightly and get that great pan-fried texture. 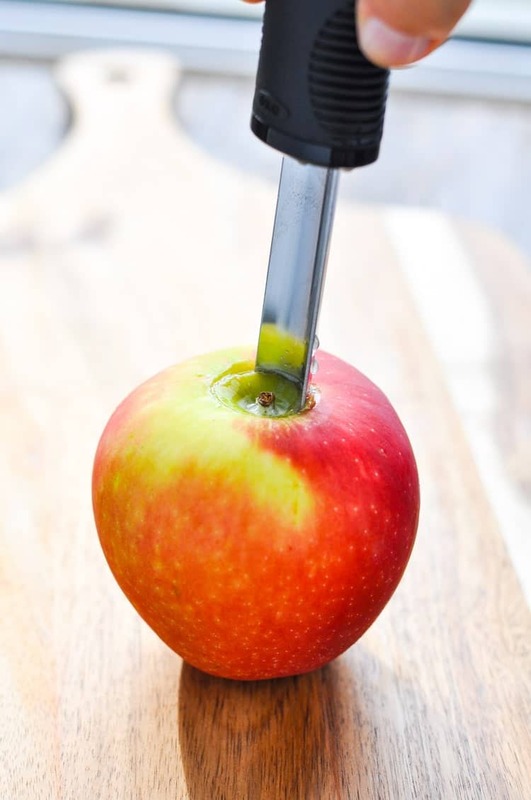 As the sugar cooks in with the butter and the apples release some juices, you’ll be left with this amazing syrup that coats your Southern Fried Apples. It’s heaven, I tell ya! 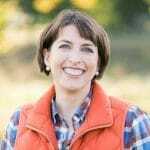 Whether you enjoy the fried apples as a side dish this season or as a simple dessert, I hope that you’ll give one of our favorite Virginia treats a try! Heat butter over medium-low heat in a large, heavy skillet. In a small bowl, stir together sugar, cinnamon and salt. Set aside. 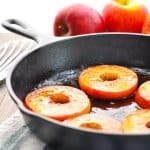 Place the apples in a single layer in the bottom of the skillet. Sprinkle half of the sugar mixture over the apples. Cook apples for 5 minutes without moving them. Then use a spatula to gently flip (or stir) the apple slices. Sprinkle with remaining sugar mixture and continue to cook apples over low heat until apples are tender. Be careful not to overcook the apples or they will fall apart. Serving a Larger Family? Just multiply the recipe to prepare as many apples as you need. You can fry them in batches. I’d love the recipe for Carole’s brownies. They look amazing; are they homemade? Hey, Teresa! They’re from a boxed mix! 🙂 I think that she may have added extra chocolate chips to the batter, though. And sprinkle the top liberally with powdered sugar once they cool! Love the pictures and the stories that you tell with your post while sharing a wonderful. Hope to see more like this from you. I’m new to you site and think it is amazing. Me and my family just committed to doing the 30 day slow cooker challenge from December last year and are looking farward to it. Hey, Stine! 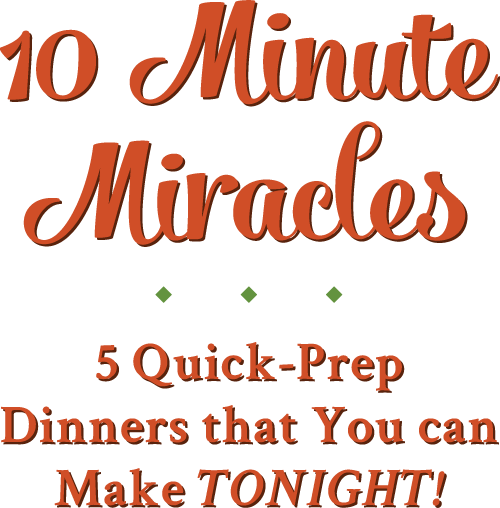 Thanks for your note, and I’m so glad that you’re going to try the healthy slow cooker recipes! I used to have a “Skip to Recipe” button on my blog, but it wasn’t compatible with a site upgrade that I made to my recipe cards. I wasn’t able to figure out how to get a new one set up, but it’s on my “To Do List” when I hire a programmer to fix a few things. Thanks for that feedback! What a great week-so fun! We were also battling crappy weather this weekend-so the hubby and I stayed in Sunday and played Monopoly and ate popcorn for at least 3 hours! Hey, Kendall! Yep — there was a lot of Monopoly playing this weekend! 🙂 Hope the weather clears up for you this week. Thanks so much for reading the blog! Where is the fried apple recipe? I scrolled through all twice nd never found it. Hi, Janet! I just double-checked and it’s there! 🙂 If you look just below the long image of the Fried Apples (with the text on it) you should see the full printable recipe card. To make it really fast, try clicking on the green “Jump to Recipe” button at the very top of my post. 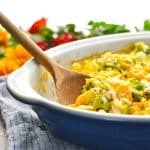 It will take you right to the recipe box and will skip over everything else. 7I love fried apples,and have made them one other time. 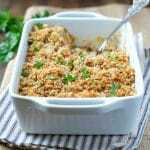 But couldn’t find the recipe so I found this one,it was quick and easy. And soon good,I thought I was in heaven. Thanks for sharing. 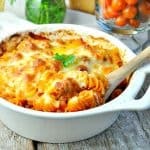 Will be trying more of your recipes.